I have had numerous requests for information on how to properly connect an emergency power source to an urban home, or a rural area electrical system. As with all of the information that I provide my clients, I must strongly recommend that unless you are very proficient and confident with your skill level, I would suggest that this project be performed by a competent, reputable, and licensed electrical contractor. A mistake here could result in serious injury or even death for the person performing the task, or to a power lineman working to restore the problem with the utility’s power distribution system. I personally feel a great need to provide information on this subject, as I have fielded many questions that make me very wary of how some generators are tied in to systems. For example, I have seen some cases where a ‘cheater cord’ is used to feed power from the generator back into a system via a range outlet, or an electric dryer outlet. The perpetrator(s) will defend this action by saying that they just shut off the main breaker to isolate them from the utility power. This does work, however being human, we will inevitably make mistakes and the results can be deadly! Just as power is transformed from a high voltage to a useful, safer voltage such as 120/240V in our homes, this temporary power from the generator will be stepped back up to the high voltage if the main breaker isn’t off. As you might imagine, this would be a major problem for a utility lineman working on what should be a de-energized line. The other issue is equipment damage if you should forget to disconnect the generator, and turn the main breaker back on when utility power has been restored. This is why the code demands the use of an approved transfer switch. Of course, the idea of having backup power in the event of a prolonged or poorly timed utility outage is very valid. With the recent hurricanes and tropical storms in the southeast United States, the tsunami disaster in Japan, and last year’s blizzards on the eastern North American coastal states, people in these areas are easily convinced that emergency backup power is a great idea. So, if you think that you can handle this project, and have checked with your local electrical authority to see if you are allowed to work on your own electrical system (this varies from city to city, county to county, province or state to state, and country to country), and can get the proper permits, inspection, and you have checked your insurance coverage, then we’re ready to explain the steps involved with this project. The primary component required in a project like this is that you MUST have a means of isolating the power provided by the generator (or alternator) from the utility power system, and vice-versa. This is accomplished by the installation of a transfer switch, or a generator transfer switch subpanel. In my predominately rural location, the most common device that we install is a manual transfer switch, and is usually requested by farmers or acreage owners where dependence on electricity is more crucial for home heat, and to provide water for livestock, etc. Another factor is that more isolated locations are more prone to utility outages, and generally take longer to restore service. A transfer switch must be sized according to the size of the service, and is usually installed right after the power meter, so that the generator can supply the entire, secondary distribution system. These transfer switches can be operated manually, or an automatic system can be installed. A transfer switch subpanel is used to select important electrical circuits, pull them out of the main service panel, and feed them from the generator panel, which is supplied by either the utility or the generator. In both cases, the function of these devices is to ensure that the utility power, and the power supplied by the generator can physically never be connected to the load at the same time. Breaking it down to the most simple, and easy to understand example, think of a transfer switch as a 3-way switch. The utility power would feed in on one of the traveler connections, and the generator supply on the other traveler. The load would be connected to the common connection. As you can see, this makes it impossible to have both the utility and the generator connected to the load at the same time. To decide what type of installation is right for you, first decide what size of generator / alternator that you are going to use. If you are using a transfer switch, and want your entire electrical system on backup power, the larger KW output of generator that you can get, the more loads you can operate on backup power. For example, take a typical 100A service at 80%. To get 80A of backup power at 240V would require a continuous output of 20 KW (a big generator). If you are backing up the entire system, any less power and you will have to turn off breakers for heavy, non-essential loads so that you don’t overload the generator. I wouldn’t recommend any less than a 6000W unit if using the transfer switch option. If you plan to use a smaller generator, in the 2500W ([email protected]) – 4000W ([email protected]) range, then it is better to go with an emergency power transfer switch subpanel. These panels are usually sized with a 30A main breaker and are good for up to a 6000W ([email protected]) generator. In this case, you have to decide what loads are essential to have on backup (heating system power, freezer, fridge, microwave, and selected lights), and if there is any capacity left after that, go with some of the “nice to have items”. You will only have a few branch circuit positions in the panel so you are fairly limited as to what loads you back up. Now some decisions have to be made, based on the information laid out above on which application will work for your situation. Which system will you choose – transfer switch panel, manual system transfer switch, or automatic system transfer switch? For the most part, the electrical power grid is remarkably reliable when you consider all the potential that exists for problems to occur in the production and delivery of power to our homes and businesses. That being said, interruptions do occur, and they don’t usually happen when we are out enjoying the great outdoors in perfect weather conditions. Outages usually happen when we are relying on the safety and convenience of electricity the most, like in the frigid temperatures of a snow storm, the horizontal blowing rain of a hurricane, the icy rain or hail accompanying a tornado, or during the scorching temperatures in the peak of a summer heat wave. The financial and emotional toll of these power outages only amplify the already traumatic conditions that these natural disasters inflict on us and our families. Having an alternate source of electricity to supply our homes during power outages is a relatively inexpensive way to offer some peace of mind. This e-book is the first in a series of three giving detailed instructions, complete with diagrams and pictures, on how to install a back-up power system. We take an example of an automatic system that includes a generator and transfer switch installed in a rural home application. NOW ON SALE FOR ONLY $9.99. Available as an instant download. WAIT – SPECIAL OFFER! ADD ‘The Basics of Household Wiring’ DVD to your order and SAVE! 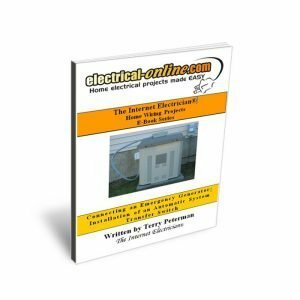 This excellent DVD provides a complete breakdown of the basics of electricity, with step-by-step instructions and examples of wiring electrical outlets, switches, light fixtures, plus much more, in the home. Over 83 minutes of top notch instruction. A must review before you attempt any DIY wiring project! This entry was posted in Electrical Projects, Outdoor Wiring, Wiring Projects. Bookmark the permalink.